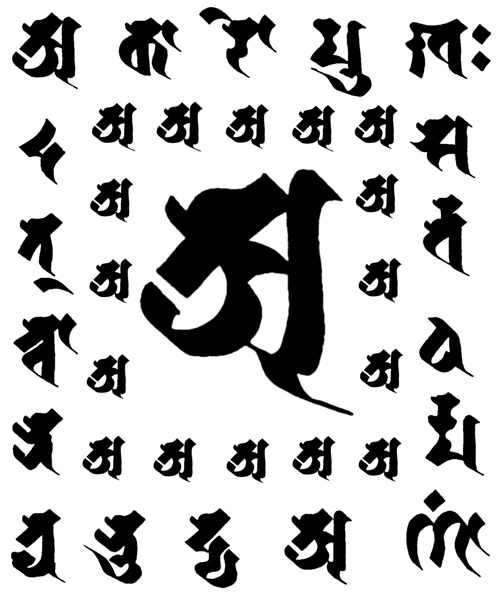 A design incorporating the aksara A and the phrase akāro mukhaḥ sarvadharmāṇāṃ ādyanutpannatvāt from the Pañcaviṃśatisāhasrikā Prajñāpāramita Sutra (The Perfection of Wisdom in 25,000 lines). It is surrounded by the ring of smaller a syllables. nu tpa nna tvā t .